For readers who are confused between Samsung Galaxy K Zoom or the Nokia Lumia 1020, whether which one to buy, here is a specs comparison between the two. The comparison will help readers make an informed decision. Galaxy K Zoom is powered with a 4.8-inch super AMOLED capacitive touch screen with 720x1280 pixels resolution whereas, Nokia Lumia 1020 encompasses 4.5-inch AMOLED capacitive touch screen with 768x1280 pixels resolution. 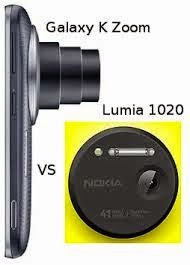 Samsung Galaxy K Zoom is an android-based phone whereas Nokia Lumia 1020 is a windows phone. Galaxy K Zoom is equipped with 8Gb internal memory that is expandable up to 64GB with the help of a micro SD card. On the contrary, Lumia 1020 is equipped with 32GB internal memory with no micro SD slot. The unique selling proportion of both devices is their primary (rear) camera. Samsung Galaxy K Zoom- 20.7MP rear camera with auto/manual focus supported with 10x optical zoom. The camera support optical image stabilization and LED flash. Nokia Lumia 1020- 41MP rear camera with Nokia signature lens i.e. Carl Zeiss optics. Like Galaxy K Zoom, Lumia 1020 also support optical image stabilization, auto/manual focus and LED flash. As compared to 41MP of Lumia 1020, Galaxy K Zoom 20.7 MP lens is as half powerful as the number itself, nevertheless the latter still a hold a strong comparison between the two. Galaxy K Zoom sports Li-ion 2430mAh battery that supports a talk time of about 14 hours on 3G data usage. On the other hand, Lumia 1020 comes with a non-detachable Li-Ion 2000mAh battery that allows approx. 13 hours and 20 minutes on 3G. Both phones are placed in similar price bracket which is somewhere around INR 30K but buyers have various options to buy them at highly discounted prices. Thanks to widespread usage of internet, today we have plethora of e-commerce websites that offer mobile phones at multiple discounted rates. However, before purchasing, buyer should ensure that the provider is an authorized dealer of Samsung or Nokia whatsoever, and that you get a warranty card along with your choice of device.